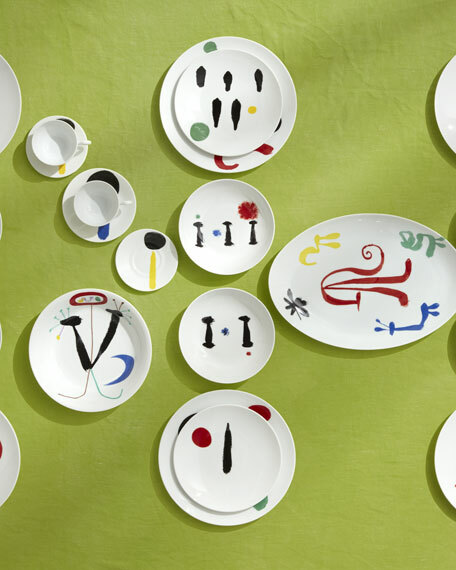 Making the work of Joan Miró accessible in unexpected waysthis was what prompted Successió Miró to approach the French porcelain manufacturer Bernardaud. The intense and highly demanding partnership that ensued gave rise to this table service taken from the book Parler Seul. 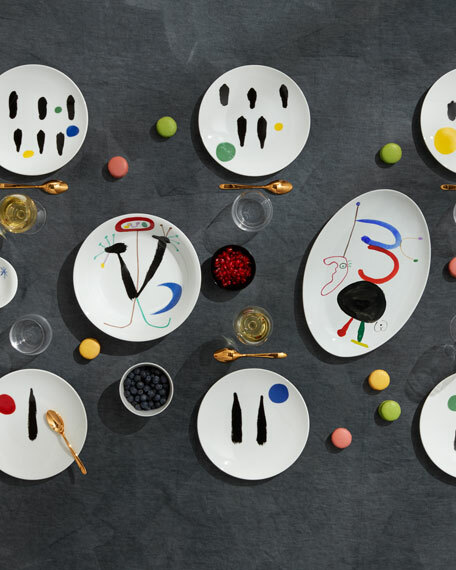 Its 100 pieces use the precision of porcelain to express the painter's extraordinary freedom, and invite us to partake of an undeniably joyous meal. Limited Edition set of 100 sets containing each 100 pieces. 12 each of: dinner plates, salad plates, coupe soup bowls, bread and butter plates, tea cups, and saucers. Six each of: tapas plates, AD cups, and AD saucers. Two each of: relish dish and medium bowl. One each of: 15" platter, 13" platter, deep salad bowl, deep round dish, open vegetable dish, and large tumbler. Ships in two boxes, approximately 40 lbs. each. 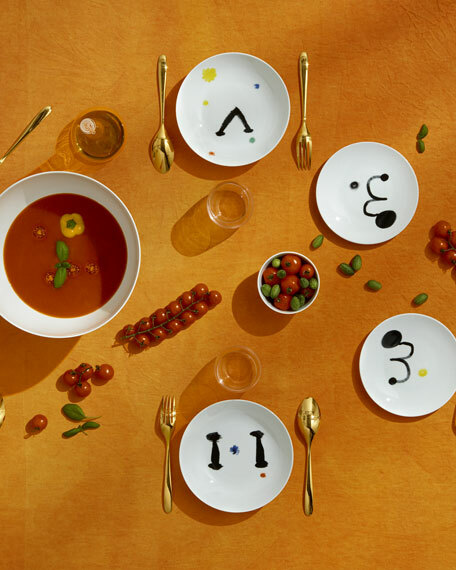 Bernardaud has long enjoyed creative interaction with paintersfrom Calder to Chagall via Van Dongenallowing the qualities of porcelain to transpose their work in a respectful manner. 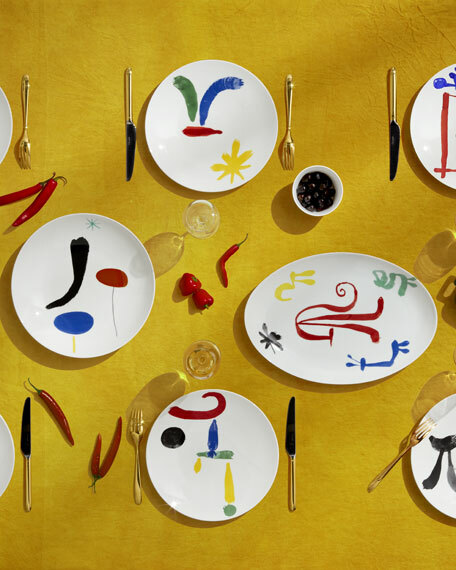 It was this exigency, sensitivity, and desire to share with generations to come that led Joan Punyet Miró, Joan Miró's grandson, to call upon Michel Bernardaud. Their encounter was the start of a trusting, exacting partnership. Successió Miró was founded in 1996 in Barcelona to preserve the memory of Joan Miró and transmit his moral and artistic legacy. It conserves a documentary and photographic archival collection which can be consulted by the public. In keeping with the artist's wishes, it encourages and facilitates the study of his work by contributing to its exposure and permanently monitoring exhibitions held across the globe in museums, galleries and auction houses. Joan Miró and his wife Pilar succeeded in transmitting the sacrosanct principle of family cohesion to their heirs, as seen in the commitment of their grandson, Joan Punyet Miró, spokesperson of their heirs, to promote and defend the artist's work. "My grandfather adored ceramics", says Joan Punyet Miró. "His ceramic-tile walls are famous, but he also made several works in porcelain at the end of his life. However, what struck me most about this joint venture with Bernardaud is that my grandfather was very attached to his family and to the meals that we shared altogether. He liked us to gather round a table. For him, it was very important to eat, in silence, to observe the cutlery and plates, to analyze the bread, to select a good red wine and appreciate my grandmother's superb cooking. Meals were also a source of inspiration for him: he took the napkins and bread and in front of our very eyes, he made a sculpture! It was a creative instant that he enjoyed sharing with his family in an infectiously enthusiastic manner. This is why I wanted this ambitious project to rest on the following four pillars: family, ceramics, poetry and culture." These words of Joan Punyet Miró were invaluable for Bernardaud, for they brought the artist's work to life and formed the invisible thread that would guide the research undertaken in Successió Miró archives and Fundació Joan Miró in Barcelona. The aim behind this research was to find original documentation that could be transposed to porcelain without misrepresenting it. When browsing through the book Parler Seul, it became apparent that the illustrations for Tristan Tzara's poem should be the ones to feature on the pieces of the tableware collection. "Parler Seul seemed the perfect book with which to create this work," explained Joan Punyet Miró, "because it respected Miró's work as a whole, highlighting the importance of poetry and illustrating the wealth of volumes and colors employed, while transposing all of this to the table through the use of porcelain." Each guest is able to browse the work in turn, from first course through to dessert.